Here is an overview of the different black materials used in vintage and antique jewellery. Jet is fossilized wood, specifically fossilized resinous driftwood, originally from the Monkey Puzzle Tree, pressurized between layers of shale in the Jurassic period. It has a feel like no other substance. Smooth and mat and velvety, almost warm to the touch, it isn’t like wood or like stone or like rubber…it is unique. Once you have handled real jet you will never forget the feeling in the hand. Jet is considered to be one of the ‘organic gemstones’ (the others are pearls and coral and amber). A common misnomer for jet is ‘black amber’. Another confusion is that jet is often used to describe the color black and not just used to describe the substance. (So if someone says that have a ‘jet necklace’ check that they don’t just mean they have a black necklace). The first piece of jet jewelry dates from 17, 000 B.C in Spain so it has truly been in favor for a long time. It was also popular in Ancient Rome and has also often been used for rosary beads. However, in more recent times jet truly came into vogue after the death of Prince Albert in 1861. As mourning jewelry became so popular, jet became a very favored substance and was always part of Queen Victoria’s mourning dress. In the 1920s, the flapper girls favored long strings of jet beads and found them excellent accessories for dancing. Since the town began production in 1800, the most sought after jet has been from Whitby in Northern England. ‘Whitby Jet’ is prized worldwide and is still a thriving production center. Jet is relatively soft and is easily carved. There are some stunning carved designs of Whitby jet, particularly brooches, which came in a large variety of designs. Jet is also easily polished. Carved Whitby jet brooch, late Victorian. (This brooch is showing some slight damage around the edges). 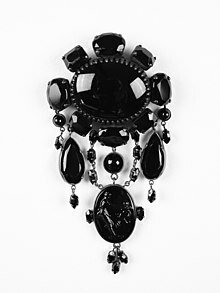 Carved Whitby Jet Brooch, circa 1870. The word ‘Mother’ as well as first names were popular, probably to remember deceased loved ones. There are many other substances which are often mistaken for jet. Onyx may have a similar look but is much cooler to the touch and shinier. French jet is not jet at all but is in fact black glass. Vulcanite or ebonite, Gutta Percha, coal, bog oak, epoxy resins and other substances have all been used in the past to imitate real jet. It is worth becoming familiar with all of those just so you can better identify jet. One test for jet is to rub it on some unglazed porcelain; real jet will leave a brown mark. However, once you have handled a few pieces you will find this unnecessary. Jet is the most valuable of all the previously named substances apart. It is considered highly collectible, particularly Whitby jet. Personally, I believe a simple jet bead necklace and some drop earrings are the most wearable and stylish ways of wearing jet in the modern era.